In spellbound lands of fear. Ending three in crystals clear. Add four elements, make a spell. Say the word that sets them free. 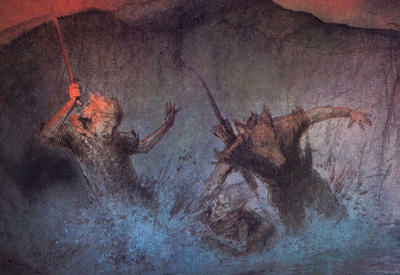 Richard, Orkan, and Melek jump into the lake as the fire devours the wood behind them. They hope to reach the opposite shore and pray that the lake doesn't catch fire like the very earth behind them. Melek initially has trouble with the Book of Prophecies on his back, but he eventually gets the hang of swimming, as does Orkan. As the trio swim out into the lake, Richard is surprised at how wider the lake looks than it did from the shore, and that the waters seem to be widening. Eventually, when he looks around, he sees nothing but blue water in every direction. As Richard tries to grasp the situation, he suddenly feels a tugging at his feet. Without warning, he and his friends are caught in a whirlpool that appears in the middle of the lake, pulling them to the bottom of the lake. Orkan and Melek disappear first underneath the spray beneath the water's surface, and Richard follows soon enough. Their journey comes to an end when the trio lands on a cold stone floor in a cave. Richard immediately asks where they are and what happened, and Melek consults the Book of Prophecies for answers. The three discover that they're in the "lands of fear", thanks to the "witches brew" that was the whirlpool. Richard looks around and sees the only source of light illuminating the cave to be coming from a lone passage in the cave. Without much choice, Richard leads his companions down the tunnel. While walking down the corridor, the trio realize that the walls are closing in and the ceiling is getting lower. Horrified, the three scramble to get out of the tunnel before it crushes them. They turn a corner and see the safety of a cave beyond the closing mouth of the tunnel. 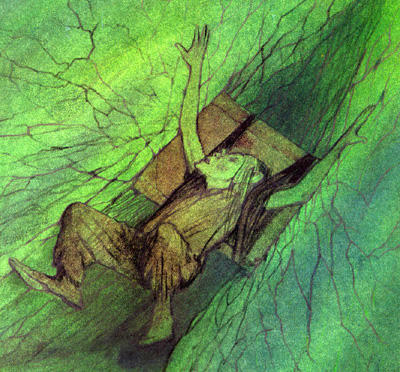 Richard and Orkan dive through the closing opening into the cave, but as Melek attempts to leap to safety the closing tunnel catches him by the enormous Book of Prophecies on his back. Orkan grabs the struggling scribe to pull him free, and Richard attempts to loosen the ancient tome from the tunnel's squeezing grip, but the book is wedged fast. Desperate, Richard draws his dagger and chips away at the rock holding the book. At last, the stone chips away and Melek and the Book of Prophecies are freed, and they step away just as the tunnel snaps shut angrily. After calming themselves down, the three try to get a bearing on their surroundings, again seeing only one exit to the cave. But before they can move, the tunnel floor begins to move, turning into a brown carpet with flickers of red. Richard cries out that they're rats, and Orkan orders his friends to hurry to the passage or they're finished. Richard and Melek follow the pigman as he carves his way through the rats down the tunnel, but the rats are endless. It's then that Richard notices that whenever Orkan cuts down a rat, its corpse vanishes. The Chosen one looks down the tunnel and sees the sea of rats fade away into the distance. He suddenly realizes the rats are illusions spoken of in the Book and tells his friends. The rats abruptly turn tail and flee, but in their place appears the largest rat they had ever seen. 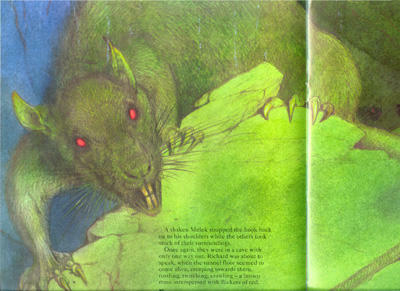 Richard still believes this giant rat to be an illusion, so he draws his dagger and aims it at the rats' vicious face. Richard's blade finds the rat's face, but instead of vanishinig the giant rat inflates like a balloon and then its body bursts, blood spewing from its mouth. After a moment of stillness, the giant rat's carcass then disappears into a puff of smoke, cloaking the room in fumes. When the smoke clears, the three find themselves standing in a different cave, one made of crystal. In that room, they find a woman standing near a throne. The woman hisses that they'll go no further and identifies herself as Zibella, the all-powerful. She then points a finger at Richard and begins to chant something. Richard immediately goes numb and feels his body changing. Richard, Orkan, and Melek feel helpless as they watch the room grow larger...no, themselves grow smaller. To their horror, the trio discover they have become "smaller and greener and wartier and springier and croakier and...web-footed!" 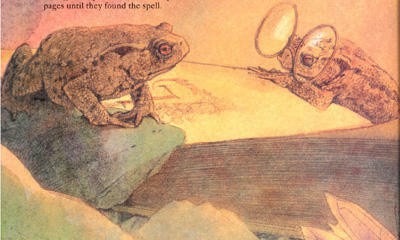 Zibella has turned them into toads! 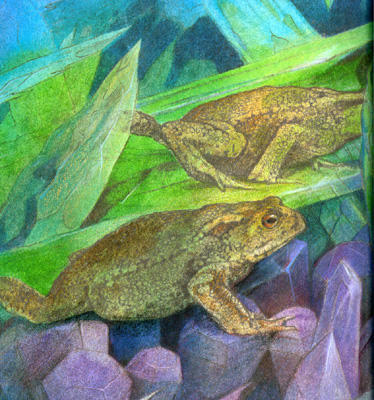 Richard hops over to his companion toads, one of them still wearing spectacles and the other noticeably angry with Orkan's temper. Orkan and Melek have difficulty adjusting to their new bodies, but Richard remains calm and senses Golan's voice telling him to find the Book of Reversals. Once his friends calm down, Richard asks Melek to recite the day's verse from the Book of Propechies. Melek does so, and Richard realizes that they need to take the first letter of each sentence to form a word: LIBERTAS. Now they need to find the Book of Reversals, which they begin a search for. From Earth a crystal, sparkling bright. Which turns to a bubble and rides the Air. And break the sordid spell. The companions realize they need to find the four elements to compose the spell, but Richard discovers that the elements are already right by them: a candle flickering by the book, and water dripping from a crystal into a shallow pool. 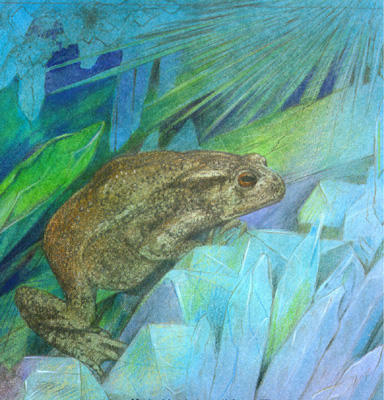 Using his powerful legs, Richard leaps at the candle and topples it, in turn knocking a crystal into the water. A rainbow-colored bubble rises into the air, meaning the four elements have been linked. Richard shouts out "Libertas", and time seems to rewind as the walls to the cavern abruptly grow closer. Within in an instant, Richard and his friends are back to their original forms. Relieved to have returned to normal, the trio look around the cavern and see Zibella perched on her throne. The witch glares angrily at the three, but Orkan is just as livid. He reaches into his quiver pulls out an arrow into his bow, aimed directly at Zibella. Zibella casts a spell at Orkan, and the pigman suddenly pivots, his arrow now aimed at Richard. Orkan fires the arrow, but Melek sees Zibella's trick and manages to show Orkan roughly to disrupt his aim. The arrow flies by Richard and bounces harmlessly against the cavern wall. Orkan turns back to his original target for another attempt, but Zibella is for some reason laughing. Suddenly, a loud crack splits the ground and the cavern begins to shake violently. Crystals shatter and the bedrock groans under the pressure, all amidst the witch's insane cackle. As this happens, Zibella begins to change shape, her beautiful form shapeshifting into that of an old hag. With the transformation complete, Zibella begins to caper madly from crystal to crystal, still laughing wildly. Richard looks around in desperation for a way out, but the floor is cracked into a number of tiny islands that grow smaller with each passing moment. 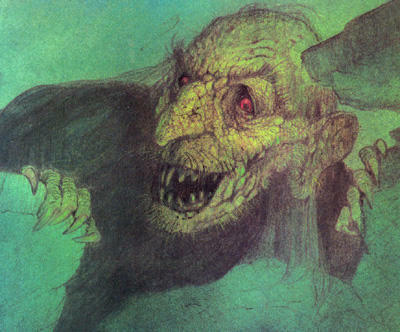 Realizing they have only once chance, Rirchard orders his friends to follow him and he leaps into the abyss. Zibella is a mysterious witch who lives beneath a lake in her own lair. Little is known about Zibella, including whether or not she works for the Evil One. What is known is that her spells are based upon incantations that she either memorizes or looks up in various magic books. The lair she lives in is surrounded by countless crystals - her throne is made out of prisms - and these crystals may be a way to amplify her power. She also appears to be overconfident and utterly insane. ..."Her mirth came in spirts and jags, ear-splitting cackles of merriment that rang remorselessly through her crystal cavern. At the same time she began to change, her icy beauty turning into the withered features of an old hag. "Zibella's hair thinned and shrank back on her scalp, her cheeks wrinkled and sank, her eyes pouched and glazed over into opaque pebbles. Her whole body hunched over, and even her clothes disintegrated into rags. Soon she was little more than a withered black shape that capered madly from crystal to crystal." For the tenth volume of The Ancestral Trail, we are presented with another stand-in villain who provides no involvement in the main quest of the story. In fact, Zibella is a rather puzzling villain, indicating she is really not that important or author Frank Graves didn't spend that much time fleshing her out properly. 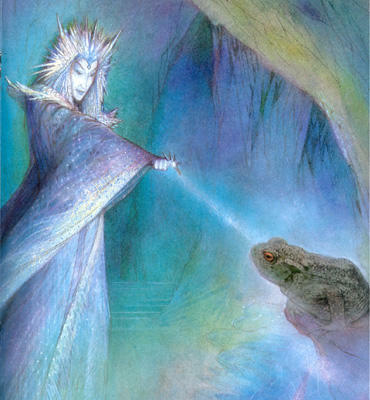 Zibella is either very overconfident or incredibly stupid, since after she changed Richard and his friends into toads, she allowed them to wander her cave and even access her spell books. This could also be an indication that she has no connection to the Evil One (since she doesn't know who Richard is), but why does she still allow them to roam free like that? Her reaction at the end of the book is also quite puzzling. After her attempt to have Orkan shoot Richard failed, Zibella begins laughing wildly and brings the cave crashing down on them. She changes from a beautiful woman to an old hag, suggesting either her power is fading somehow and showing her true form or she no longer cares about hiding her appearance because she has chosen to die along with Richard and his friends. Why Zibella would choose to do this is strange, to say the least. Did she not have the ability to toy with the trio? Why do something like this unless as a last resort? Getting away from the story, the playing card that displays the villain of this book shows something that will become a trend for later cards: using brand new artwork for the picture instead of artwork from the book itself. Looking closely, you can see that Zibella's appearance in the playing card is a little different from how she's drawn in the actual book. The likely reason for this is that the artist who drew the book knew what creatures were coming up in later issues, but those later issues were not to be created for a while. 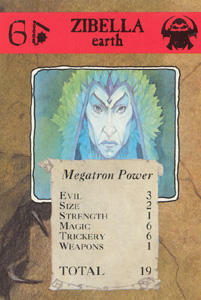 So stand-alone pictures were drawn for playing cards with monsters that only appeared in much later issues of the series. An interesting result of this is that there are several instances where the creatures' pictures in the cards look very different from the creatures' pictures in the issues. Examples of this will be demonstrates later on. "The tunnel's closing up. Run!" Richard: Rats. Thousands of them! Orkan: Get to the tunnel's mouth. If we can catch them there, we'll have a chance. If they surround us in the cave, we're finished. "It's a trick. Remember the prophecy spoke about nightmares? It must be an illusion of some sort. These things aren't real." "Testament's beginnings see! Join the first letter of each line and we get 'Libertas'. Now we must find the Book of Reversals."